Heat oven to 375°F. Unroll dough onto ungreased cookie sheet. Starting at center, press out dough into 15x10-inch rectangle. Bake 10 minutes. Remove from cookie sheet; cool 5 minutes. Cut cooled crust into 4 rectangles. Top each of 2 rectangles with 2 slices cheese, 5 slices bacon, 2 tomato slices and 2 additional cheese slices. Cover each with remaining crust rectangle. Meanwhile, heat 12-inch skillet or cast iron skillet over medium-high heat. Spray outsides of each sandwich with cooking spray. Place 1 sandwich in skillet. Place smaller skillet on sandwich to flatten slightly. Cook 1 to 2 minutes, turning once, until crisp and thoroughly heated. Repeat with remaining sandwich. Cut each sandwich into quarters. 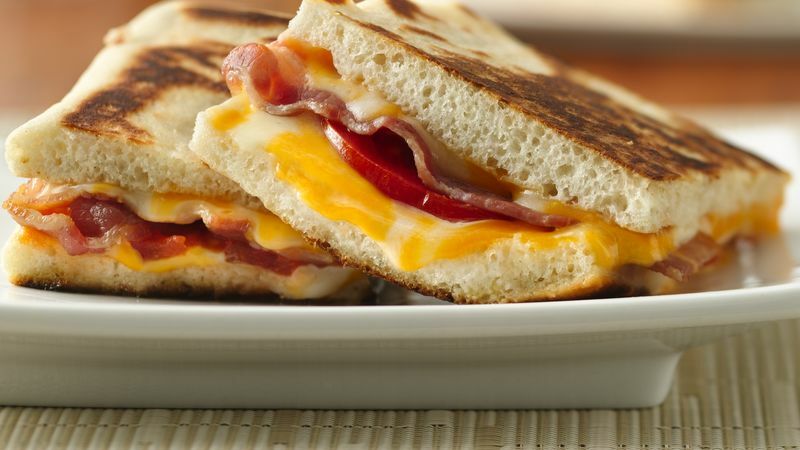 You can also use a panini maker to grill the sandwiches after assembling them—follow manufacturer’s directions.